Mumbai, September 26, 2012: Research commissioned by Tata Consultancy Services (TCS) (BSE: 532540, NSE: TCS), the leading IT services, consulting and business solutions firm, has shown that during 2012, the average-size company ($11.2 billion in annual revenue) will spend between $13 million and $22 million to market, sell and service digital mobile consumers through their mobile devices. The study, The New Digital Mobile Consumer: How Large Companies are Responding (PDF, 2.68 MB), shows that by 2015, investment levels will rise to between $22 million and $26 million annually. The race to engage this consumer segment is not evenly matched. In 2012, companies in Asia-Pacific will spend far more on responding to digital mobile consumers than companies in North America, Europe and Latin America. In Asia-Pacific, on an average, companies will spend $2.41 million per $1 billion revenue; the other three regions trail this level of investment, with $1.43 million being spent in North America, $1.59 million in Europe and $1.63 million in Latin America. Looking ahead to 2015,levels of investment will grow with spending per $1 billion N Chandrasekaran, CEO & Managing Director, TCS, said, “The digital consumer is an exciting and complex customer segment that global corporations have to understand and engage with. These consumers are diverse in their need, their interactions are flexible and often conducted ‘in motion’. Keeping their attention means being able to serve their dynamic needs by leveraging the power of digital and mobile technologies to engage with them.” revenue to increase to $1.98 million in North America (versus $1.43 million in 2012); $1.76 million in Europe (versus $1.59 million); $2.85 in Asia-Pacific (versus $2.41 million) and in Latin America a remarkable $2.72 million (versus $1.63 million). The study also reveals that investment levels are driven by organizations that recognize fundamental business changes are needed to win the loyalty of consumers. The study makes it clear that the digital mobile consumer is a highly influential profile of customer. Recognition of their potential impact on the business is such that 82% of “leader” firms said they have made the digital mobile consumer a unique market segment. A striking number of these firms (85%) created a new product and service offering for digital mobile consumer. In contrast, there are businesses across all four regions which are failing to address the opportunity presented by the digital mobile consumer. Just 28% of “laggards” have made the digital mobile consumer a unique market segment, while only 30% of such firms have created new product or service offerings for this audience. 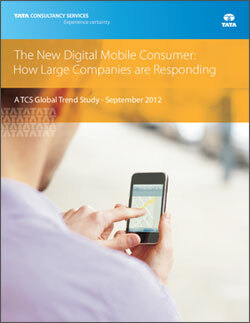 Companies that participated in the study are exploring innovative ways to engage the digital mobile consumer. Leading companies are not just limiting their mobility strategies to just smartphones and tablet computers but are looking at ways to improve the entire experience that consumers have – beyond the purchase transaction – and are starting to transform the way consumers research, buy, use, adopt and troubleshoot their products and services when they are on the go. For the complete report and detailed findings, visit www.tcs.com/digitalstudy. TCS designed the study to focus on consumer industries, both manufacturing and service companies, in four regions of the world: North America, Europe, Asia-Pacific and Latin America. The online survey was fielded by ResearchNow and included 664 participants. Responding companies were divided into two groups: those perceiving themselves far ahead of competitors in winning the digital mobile consumer, and those behind the curve. In addition to the online survey, seven organizations were interviewed in-depth about their individual mobility initiatives. Tata Consultancy Services is an IT services, consulting and business solutions organization that delivers real results to global business, ensuring a level of certainty no other firm can match. TCS offers a consulting-led, integrated portfolio of IT, BPS, infrastructure, engineering and assurance services. This is delivered through its unique Global Network Delivery Model™,recognized as the benchmark of excellence in software development. A part of the Tata group, India’s largest industrial conglomerate, TCS has over 243,000 of the world’s best-trained consultants in 42 countries. The company generated consolidated revenues of US $10.17 billion for year ended March 31, 2012 and is listed on the National Stock Exchange and Bombay Stock Exchange in India. For more information, visit us at www.tcs.com.